I Never Wanted The Job is a non-spy story. There’s a vague mention of a (very minor) job that Callan and Meres have to attend to, but in the end they never get to it – because they’re busy dealing with Lonely’s spot of trouble. Lonely’s been moonlighting in his cab again, but when his latest fare is shot dead he naturally turns to Callan for help. The murdered man, Ted Dollar (Val Musetti), was a known criminal and his murder bears all the hallmarks of a gangland execution. This is a strong hook into the story, especially as director Jim Goddard elected to use a crane to pull back from Dollar’s dead body. It’s certainly a striking piece of camerawork – we see Dollar’s dead body face down on the road outside his house, with a large pool of blood from the shotgun blast which hit him directly in the chest. Callan has a stinking cold and so isn’t best pleased when Lonely comes calling. This is another nice character touch as his cold has no importance in story terms, it just reminds us that Callan isn’t James Bond, he’s simply an ordinary man with extraordinary skills. When Lonely pours out his story it soon makes him forget his sniffles though, and gives us another of those wonderful two-handed scenes between Woodward and Hunter. Indeed, this episode is an excellent one for those who enjoy the Callan/Lonely relationship. There’s plenty of resigned whining on Lonely’s part, whilst Callan responds with his trademark bitter humour and anger. But although Callan’s highly displeased that Lonely has potentially involved him in a situation that’s attracting the attention of the police, for once Lonely is able to stand up to Callan. As the title tells us, Lonely never wanted the job of taxi driver for the Section and wants to pack it in. Callan is quick to remind him that if he hadn’t taken on the job he would most likely have wound up dead. And it could still happen, since Hunter has become aware that something is going on with Lonely and has asked Meres to keep an eye on things. He hasn’t ordered Lonely’s death – not yet – but circumstances may yet force his hand. Dollar was killed on the orders of Abbot (William Marlowe). Although Marlowe was probably best known for operating on the other side of the law (in The Gentle Touch) he was no stranger to playing villains and he does a good job here. He’s suitably menacing, but the audience knows that Abbot isn’t going to be a match for Callan. A key moment is the scene where Callan confronts Abbot in his club. After easily disabling several of Abbot’s minders, Callan has a simple message – leave him and Lonely alone. Simple though this is, Abbot has trouble believing it. Surely nobody would confront him just for someone so insignificant like Lonely? He’s convinced that Callan is attempting to muscle in on his manor and can’t be convinced to back down. As expected, this is the last mistake he makes. Although the story features several deaths (and Dollar’s is particularly bloody – taking a shotgun blast to the chest at point-blank range) there’s also something of a light-hearted feel about it. Possibly it’s because for once the stakes are low – the security of the nation isn’t at risk and the only trouble comes from a few members of the underworld. The closing moments, with Callan and Meres squirming in front of Hunter like two naughty schoolboys, is particularly telling. Hunter might have been aware that something was going on with Lonely but he asked Callan to fix it – with the implication being that he didn’t want to know the details. Of course, Hunter knew exactly what had happened and after they leave the office he allows himself an indulgent smile. It’s possible to feel a little sorry for Abbot, as he was dead the moment he decided to target Callan. William Marlowe brings a touch of class to proceedings and Paul Angelis and Michael Deacon are effective as Abbot’s henchmen, Steve and Sunshine. 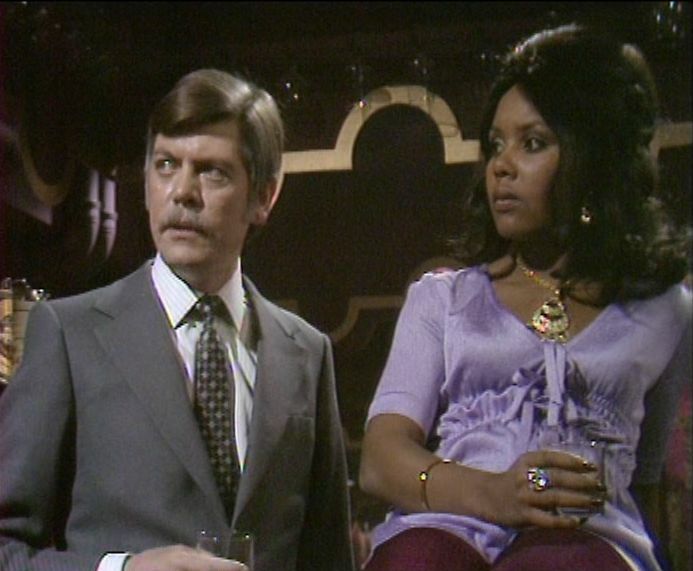 They’re the pair who threaten Lonely (and smash up the cab, much to Callan’s annoyance). For Doctor Who fans there’s an appearance by John Levene in a minor role and the ever dependable Ron Pember also turns up as a cafe owner. Although tonally different from the rest of the fourth series, I Never Wanted The Job foregrounds the Callan/Lonely relationship, which is a major plus point in its favour.